This story begins when Wendel and Marcus Wassmer leave their home in the Black Forest in Germany, to sail for America. Wendel and his brother Marcus came from the Black Forest, which then was in the state of Baden, Germany. Baden lies in the Southwest part of Germany, next to the French border. I feel they landed at a Canadian port around 1830. They worked in Toronto for six or seven years at their trade as barrel-makers. Deciding to walk South due to the cold winters in Canada, the two brothers walked from Toronto to what is now St. Wendel, Indiana, in the South-western part of the state. They probably were looking for good White Oak country to continue their trade as barrelmakers and that area was what they were looking for. This was Spring of 1837. That summer being an extremely hot summer, the boys decided to walk back to Toronto to their old jobs. Evidently, their old jobs were not available so for the third time, they again made the trip by foot back to St. Wendel area to settle for good, this being late Fall of 1837. The first ground bought by Wendel consisted of where the church, parking lot, and bank sits today. It's recorded in Posey Co. June 18, 1838. Wendel and Marcus purchased more land approximately one mile north of the church on the Posey-Vanderburg Co. Line Road. Wendel bought ground on one side and Marcus on the other. Wendel finally bought Marcus's part from him. Some of this land has always been in the Wassmer name up to Thomas Wassmer, grandson of Wendel. They had to travel to Vincennes to purchase the land. I have seen the original deed for some of this property, written on deer skin or parchment. At least Aunt Lena said that it was on deer skin. It was kept in a cupboard in Marcus's house when I saw it many years ago. Later, Andy had it framed under glass, and his son Henry has it now. It's good to know where it is. Actually, there are three parcels of land listed, and all under Wendel's name. A trip to Vincennes might help to clear this up as to who owned what land in St. Wendel, not that it makes any difference now. Katharine Mueller and her parents came from the Diocese of Fulda, Germany when she was a young girl and settled just south of St. Wendel. The correct German spelling of Mueller is with two dots above the U.
Wendel and Katharine were married in late 1839 at the house of Martin Kohl. Not having a church at that time, a priest would come from St. Joe and hold services in someone's home. The first log church was built in the spring of 1842 on seven acres of land donated by Wendel, which was located just inside the iron gates on the southwest corner of the cemetery. It was built in five days and the parish numbered around twenty families. The first priest was Father Roman Weinzapfel. At a later date, a Spahn donated some ground to enlarge the cemetery. Since the Posey-Vanderburg Co. Line Road runs directly through the cemetery, all of Wendel's ground donated was in Posey Co. and Spahn's was in Vanderburg. St. Wendel got its name in memory of Wendel Wassmer and in honor of his patron St. Wendelin, the patron saint of rural folk (554-617). The present church was built in 1853 and was solemnly blessed on Oct 22 of that year, the feast day of St. Wendelin. Marcus never married and lived with his brother until his death. He died in Wendel's home in 1846 at the age of 36. The present church was built over some graves, his (Marcus) being one of them. This might seem odd, but was not uncommon in those days. The first house where Wendel and Kate lived was close to where the bank is today. After it burned, he built across the road just north of the church. 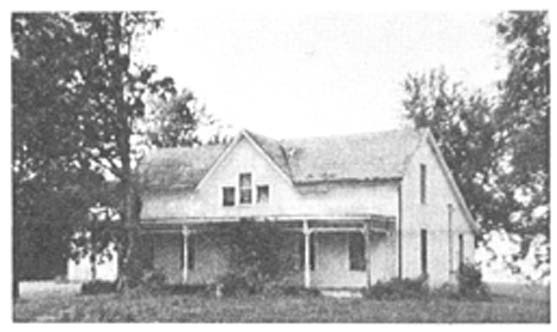 It is still standing and the original log house was remodeled at a later date to look as it does on the picture. After Wendel and Kate died, it was occupied by their daughters Fronia and Kate.